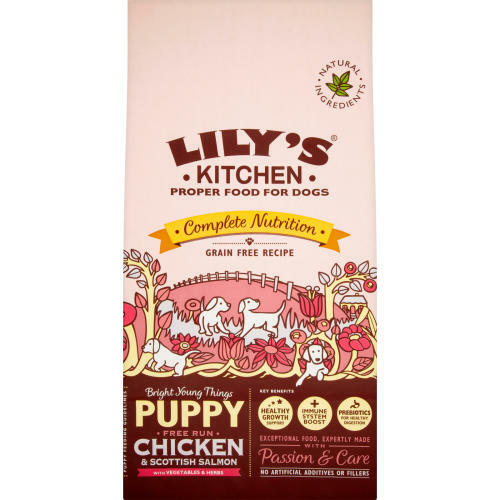 Lily's Kitchen Perfectly Puppy Chicken with Salmon is bursting with natural goodness and scrumptious fresh meat. Crammed full of free run chicken and freshly caught salmon, the specially small kibbles (only 0.5cm) are ideal for weaning puppies onto solid food. What's more, every mouthful is loaded with wholesome vegetables and botanical herbs to give your new four legged friend the best possible start in life. With added probiotics to nurture your puppy's digestive system, Perfectly Puppy also contains Chondroitin and Glucosamine promote optimal joint growth. Fresh Meat: 38%: chicken 31% (24% chicken meat 7% chicken liver), sweet potatoes, fresh salmon (7%), pea protein, potato protein, lentils, peas, eggs, chicken fat, chicken gravy, flaxseed, clear salmon oil, Botanical herbs: alfalfa, chickweed, cleavers, golden rod, nettles, kelp, dandelion root, burdock root, celery root, milk thistle, marigold petals, rosehips, apples, carrots, spinach, cranberries. vitamins and chelated minerals. Protein 27%, Fat 14.5%, Fibres 3%, Ash 6%, Omega 6 2%, Omega 3 1.5%, Calcium 1.2%/Phosphorus 1%, Glucosamine 185mg/kg, Chondroitin Sulphate 130mg/kg.